The Back-Huggar® lumbar support cushion was developed in 1968 by Dr. John Fiore to support his patients on their way home after his treatment. The Back-Huggar makes almost any seat more comfortable by exerting soothing pressure against back muscles and discs. It literally "hugs" the lower back, easing tension and relieving back pain caused by spinal nerve compression. Additionally the Back-Huggar helps to maintain proper posture and reduces fatigue. The Back-Huggar is available in five styles: the standard version for auto bench seats and straight back chairs (the most popular style); the extra wide for wider backs (2.5" wider than standard); two versions for bucket seats, the thin for the most contoured seats and the thick version for less contoured bucket seats; and the secretary, which is the same as the standard version but with an added crisscrossing strap included for open back chairs. Since 2008, Young Innovations has helped alleviate neck pain and headaches with their patented design, the enVy™ Pillow. Two registered nurses, with their combined experience and interest in anti-aging medicine and preventative healthcare, designed the original enVy Pillow, a non-toxic, therapeutic pillow which promotes both wellness and anti-aging benefits. EnVy Pillow Company has added a new offering to their line. Their child-size pillow is a collaborative effort with Dr. Jenna Davis, DC, FIAMA, and the enVy team. In her chiropractic practice, Dr. Davis has observed children as young as 7 years of age with early signs of arthritis. This new pillow, developed to promote children sleeping in proper alignment, maintains the enVy shape and design but has been modified to align and support a child's curvature and head. 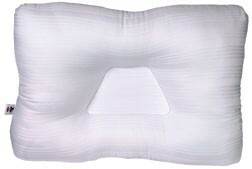 "The enVy Pediatric Pillow," according to Dr. Davis, "supports the health of their developing spine by supporting proper curvature and eliminating forward head posture while they sleep." Made in Canada, enVy Pillow uses only the highest standard of antimicrobial and hypoallergenic viscoelastic memory foam available. This chiropractic-endorsed pillow provides the correct head, neck and spinal support for optimal alignment, thereby promoting spinal health and facilitating easier breathing and a deeper, more restorative sleep. Available from select chiropractors and wellness providers throughout North America, the full-size enVy Pillow retails for $159.00 and enVy For Kids at $99. Email at info@envypillow.com for distribution or wholesale opportunities. 959 White Station Rd. S.